Leading editorialist J.J. Goldberg of the Forward takes you inside the issues affecting today’s Jewish community. 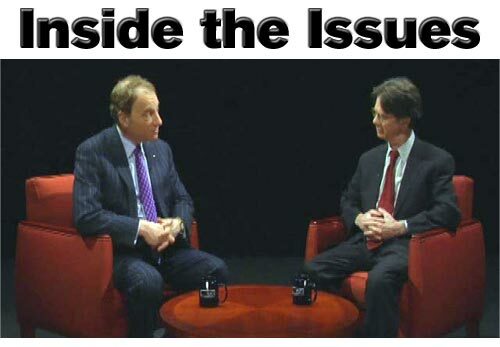 Featuring in-depth interviews with community leaders and critics, along with Goldberg’s own expert commentary, Inside the Issues is a window into what’s really happening and how it affects every one of us. Right-Wing Jews: Goldberg hears from the president and founder of the Caucus For America, Rabbi Aryeh Spero, who argues that America’s conservative presidents and Christian majority have benefited Jews. OU’s Take on Kosher Controversy: Goldberg tries to get to the bottom of the recent Rubashkins’ kosher scandal with Rabbi Menachem Genack, head of the Orthodox Union’s kosher supervision division, the largest supervisor of kosher food in the country. All About Healthcare: Goldberg gets to the bottom of the healthcare industry with the Executive Director of the Partnership for Quality Care, Kate Navarro-McKay, who offers suggestions for improvement. The Sound Science Approach: Looking at Americans’ health from another angle, Goldberg finds out about the sometimes surprising effects of agricultural trends on consumers from the Associate Director of the American Council on Science and Health, Jeff Stier. *Democratic political consultant Hank Sheinkopf offers his candid take on the presidential race. *Middle East scholar and back channel negotiator Stephen P. Cohen gives his expert opinion on the current chances for peace in the Middle East. *The results of a new survey of the American Jewish community revealed by the American Jewish Committee’s David Singer. *New emerging spiritual communities explored with demographer Stephen M. Cohen.